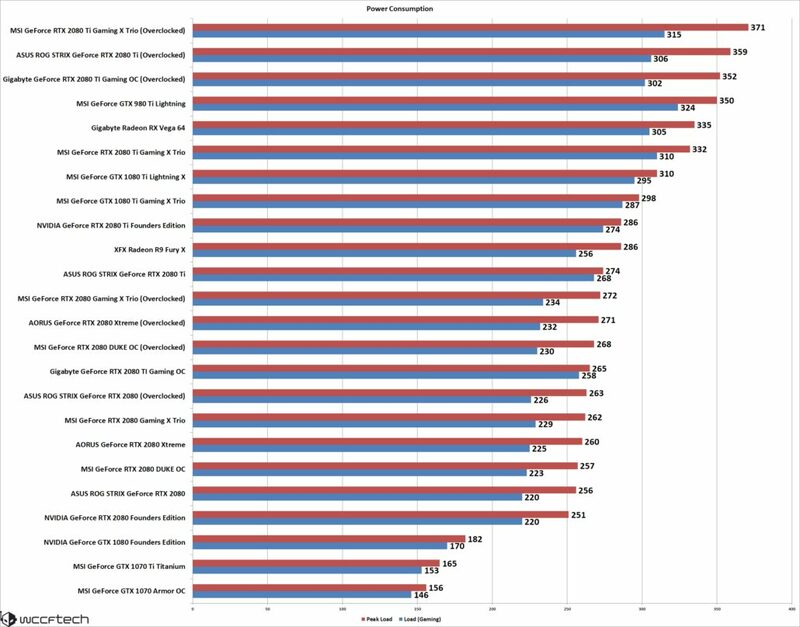 I compiled the power consumption results by testing each card under idle and full stress when the card was running games. Each graphics card manufacturer sets a default TDP for the card which can vary from vendor to vendor depending on the extra clocks or board features they plug in on their custom cards. Default TDP for the RTX 2080 Ti is set at 250W while the MSI custom model has a TDP of 300W. The default TDP for the RTX 2080 is 215W while the MSI custom model has a TDP of 250W. Also, it’s worth noting that the 12nm FFN process from TSMC is a refinement of their 16nm FF node. NVIDIA is cramping even larger amount of transistors and more cores than their previous cards, making it one of the densest chip built to date. It’s likely to consume a lot of power and the results are reflective of that. The ROG STRIX GeForce RTX 2080 Ti consumes around the same power as the Founders Edition at stock clocks which is impressive considering it features higher clocks out of the box and a 19 phase VRM design. When overclocked, we see the consumption figures rise to the same extent as other RTX 2080 Ti cards I have tested before with manual overclocks.